Learn how to configure Auth0 with Shiny Server Pro to secure your interactive R apps! As we've shown in a previous post, you can add authentication to a Shiny Server instance, allowing your server to be online without being available to everyone in the internet. 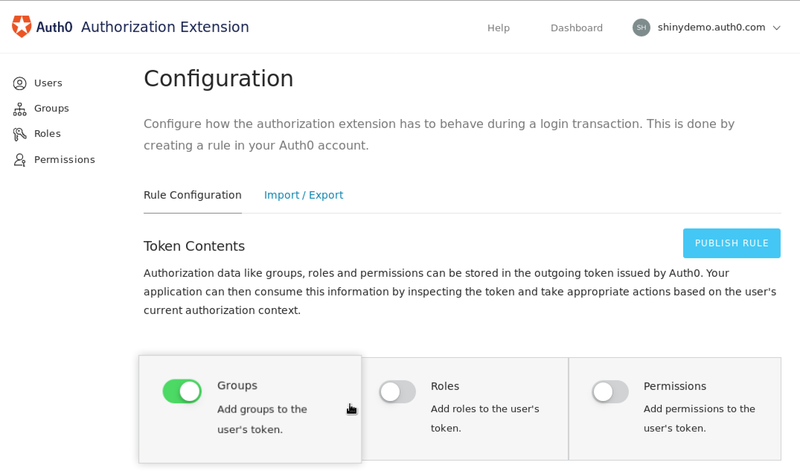 If you've been working with this and your organization has grown, you'll be more likely to find scenarios where you'd prefer or need to restrict access to a report to specific users or groups. 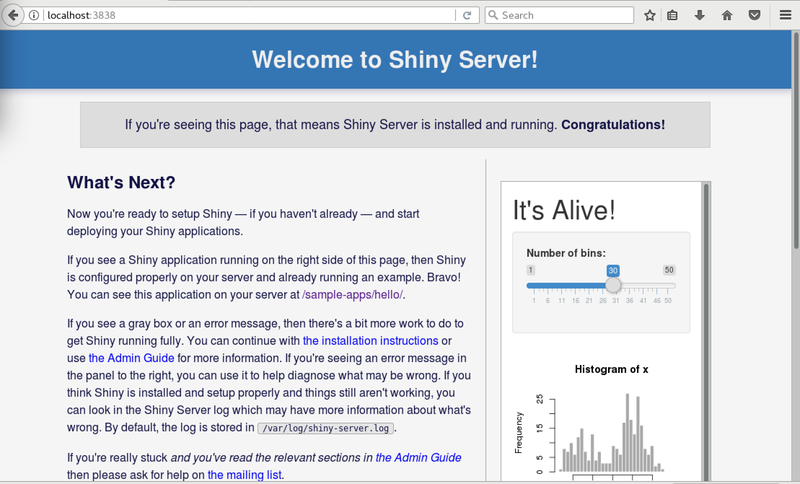 Shiny Server Pro is a paid edition which allows for this, and has a built-in authentication scheme with some options included, but these options, for one of many reasons may not be appropiate for you, if so, this is the blog post you've been waiting for! We'll explain how to use the shiny-auth0-plus proxy to pass along credentials and permissions. Note: If you are working in a small company and are scared away by Shiny Pro's pricing, take into account they have special pricing for small companies. First of all, why would you need to get authorization for your shiny apps? Well, suppose you have a report with customer PII (personally identifiable information) which employees should only access in a "need to know basis", a way to control this would be requiring a certain permission or list of users to access the report. Also, to consider a slightly more complex scenario, suppose you want sales representatives to be able to access customer data, but only of accounts they manage, you can also do this with Shiny. The code for this example is here, and in this case the report has been coded in such a way that the users membership to a company or complete admins has been hardcoded into a membership_db table. We'll recreate a similar example but using Auth0 as a proxied authentication. Apart from these, the Pro version allows for usage monitoring with a sweet admin panel, spanning multiple processes per each report to handle a bigger number of users without hanging, and allows to use different R versions per Shiny app. First of all Download Shiny Server Pro - If you don't see anything in the download box, you may have to disable your ad-blocker software, since it's a third party form. The setup is almost the same as the one described in our previous blog post, in step 1, but using the Shiny Server Pro download. Make sure it works before trying to add any authentication. Once you know Shiny Server is up and running in its Pro version, we can start to plan out how to make it work with Auth0. Nginx is a powerful and popular HTTP server. It supports a ton of features and is very fast. We will use Nginx to perform SSL/TLS termination. In other words, Nginx will act as the public facing server, with full TLS support (a must for secure connections). It will then forward all requests to our internal shiny-auth0-plus proxy server, which will run without TLS in our internal network (considered safe). This step is the same as the guide for the open source Shiny server. # TLS/SSL certificates for your secure server should go here. # ciphers and algorithms. This is a sane selection. # This proxies requests to our shiny-auth0-plus authentication proxy. # is applied at this point. The important part is near the bottom. Take a look at the last location / block. This block tells Nginx to handle all requests. Inside this block you will find two directives: proxy_pass and proxy_redirect. These directives tell Nginx to proxy requests to the host passed as parameter to them. 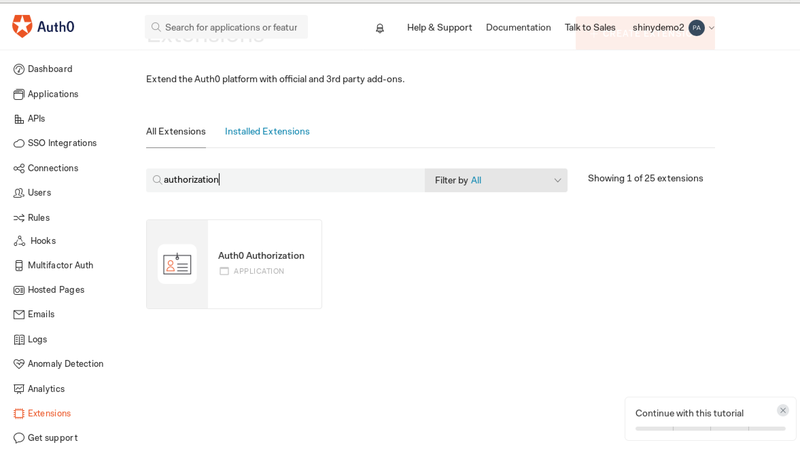 This is were you should edit the configuration file to point it to your shiny-auth0-plus authentication server, which we will setup later on in this guide. Other important directives in this configuration file are ssl_certificate and ssl_certificate_key. These directives point Nginx to your TLS/SSL certificates. These certificates are used to secure the connection to the server. You must set a valid certificate and a private key here, as TLS must be enabled to properly secure your Shiny Server installation. If you want to learn more about TLS/SSL, or find out how to get your own free TLS certificate, head over to our Using HTTPS article. You may want to consider that Let's Encrypt provides free TLS certificates with automatic updates after expiration. You can also ask your system administrator to perform these steps for you. It is also possible to use a self-signed certificate, if only certain clients need access to the server (and can install your certificate in their browsers). Last but not least, you should change both server_name directives to use the right name for your host. This is of particular importance if several hosts are being served by the same Nginx configuration. If in doubt about what this means, consult with your system administrator. In most installations, the system-wide Nginx configuration file is located at /etc/nginx/nginx.conf. Since authentication will be handled by Auth0, a free Auth0 account is required to work with shiny-auth0-plus. Don't panic, it's as simple as signing-up and setting a few knobs here and there. Let's take a look. First, head over to Auth0's signup page. Follow the steps to fill in your details. For simple use cases, a free account is more than enough. With a free account you get up to 7000 regular users. If you need more than that, check our pricing page. 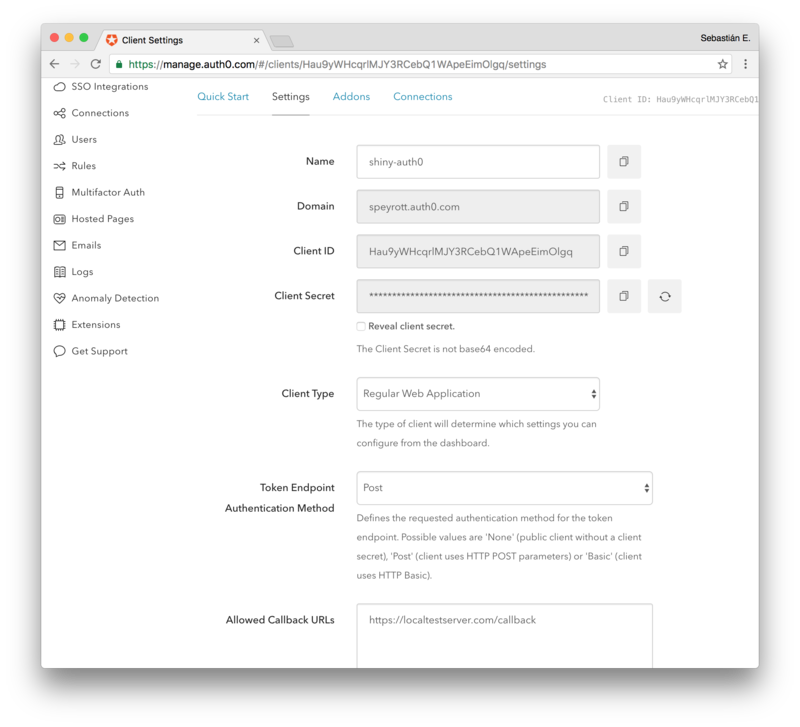 After you have completed the signup process, access the Auth0 Dashboard and create a new application for our shiny-auth0-plus app. 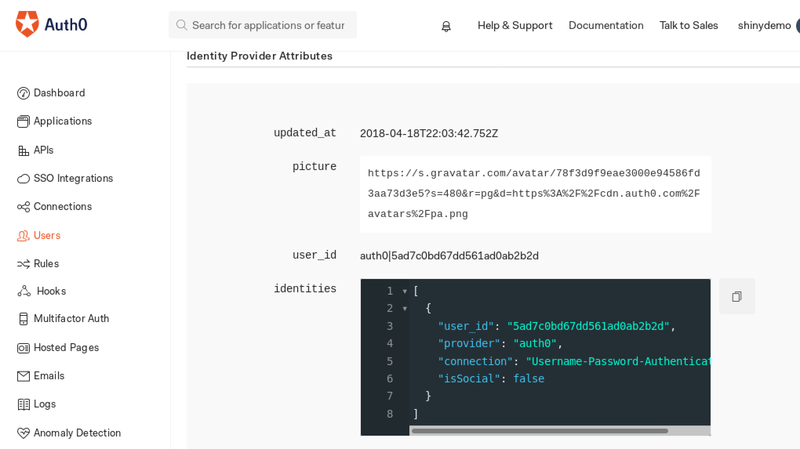 This application will let you setup how your users will log-in through the proxy. You have several options you must consider: will you use a standard username/password database? Or will you allow social logins (through Facebook or Google, for example)? It is up to you to decide what fits best your use case. To create an application go to Applications on the sidebar and then Create Application on the top right of the screen. Pick a name and then select the type of client. Select Regular Web Applications. Ignore the quickstart that is presented after that and go straight to Settings. Take note of the Client ID, Domain and the Client Secret. You will need these later to setup shiny-auth0-plus. Another important setting is the Allowed Callback URLs setting visible below. This is the URL the user will be redirected to after a successful authentication attempt. It is formed by the domain of your public server plus the callback path. For instance: https://shiny.yourhost.com/callback. In this step we'll configure a proxy that sits between nginx and the Shiny Server, which will authenticate with Auth0. First, clone the latest version of shiny-auth0-plus to the system that will run the authentication proxy. If everything went well, all dependencies for running shiny-auth0-plus are now locally installed. Now, we will setup shiny-auth0-plus. Create a new file named .env inside the shiny-auth0-plus directory with the following content, adjusted with the variables you wrote down. You will see several common names here. As you can imagine, AUTH0_CLIENT_SECRET, AUTH0_CLIENT_ID and AUTH0_DOMAIN are the client settings we took note in step 3. Proceed to fill these in here. AUTH0_CALLBACK_URL depends on the actual URL you will use to access your Shiny Server from outside. In other words, it is the URL the user will be redirected to after authentication. This should be one of the Allowed Callback URLs from step 3. It is very important to leave the trailing /callback part of the URL in place, whatever the name of your host is. AUTH0_GROUPS_CLAIM is an URL we'll use to define custom claims to add to the token, just use your shiny domain slash claims and you'll be fine. Remember to use the same when configuring your Auth0 tenant for the groups. SHINY_HOST, SHINY_PORT and SHINY_ADMIN_PORT are the actual host and ports for your running Shiny Server installation from step 1. If everything is running on the same server, the defaults should be OK (localhost and ports 3838 and 4151). Lastly, PORT is the port where the shiny-auth0-plus authentication proxy will run. This port is the port that should be set in the proxy_pass and proxy_redirect directives from step 2. If shiny-auth0-plus will run on a different host from Nginx, don't forget to update the localhost part of these directives in nginx.conf as well. If in doubt, consult with your system administrator. If you got everything right up to this step, you should get an Auth0 login screen when accessing the server (The one we mentioned as https://shiny.yourhost.com/). If something fails in this stage make sure to recheck all steps before continuing. Having logged in, go into https://manage.auth0.com/#/users and click on the user you accessed with, if you scroll down to Identity Provider Attributes you'll see the user_id, write this value down in some text file since we'll use it afterwards. Assuming everything works, you can now make some adjustments to the /etc/shiny-server/shiny-server.conf file, so the user/groups will arrive to the shiny app. With any change in this configuration file, make sure to restart the shiny-server to take the change. When this has been configured, the admin panel should be accesible at https://shiny.yourhost.com/admin/, only to the user specified up there, and https://shiny.yourhost.com/reports/ will have the reports you made available with shiny server. 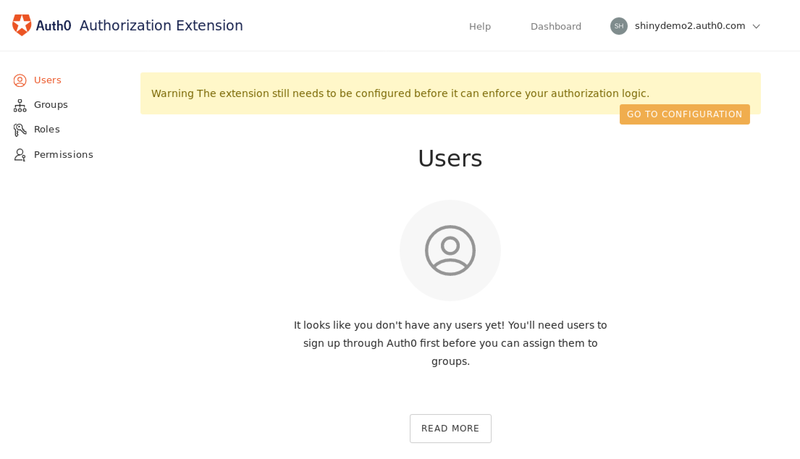 If instead of using user_ids you wish to allow access using the email of the user (which may not be available for all connection types, like SMS) you can use X-AUTH0-EMAIL instead of X-AUTH0-USER-ID. 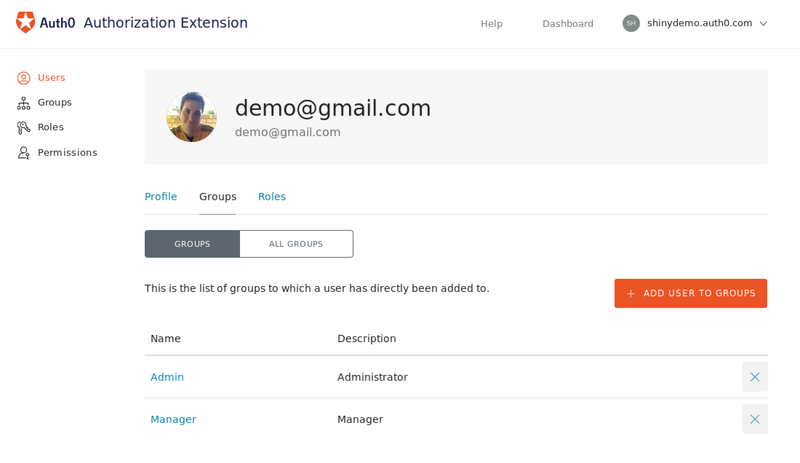 We'll implement authorization by groups to allow for specifying groups for each user, and adjust the reports using this data. 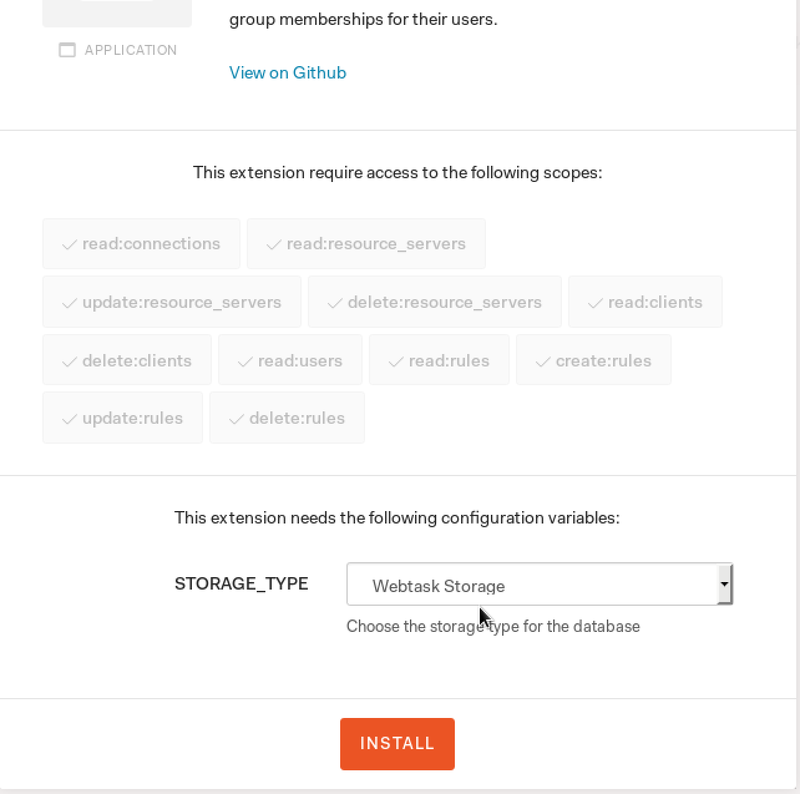 And go to the configuration section, there choose to include the groups in the token and persistence, and then click on "Publish Rule", this will generate a Rule which will load the groups that you define in the extension. 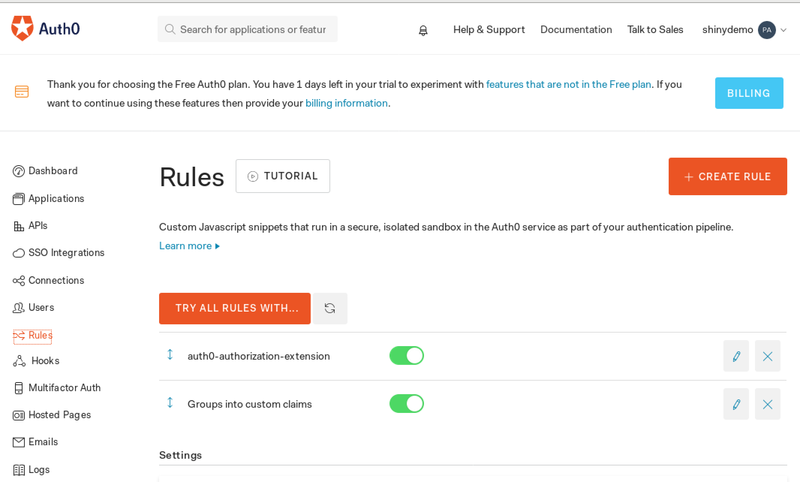 Make sure this rule runs after the rule autogenerated by the Authorization Extension! After all of this, you can head over to clone this report: https://github.com/auth0/shiny-auth0-integration-example - This example report can show you different results if it's an admin or not, and shows you the reported values at the left, you can use the code as a basis to do something more complex and allow for specific roles to access specific pieces of the data, or directly deny access to it. 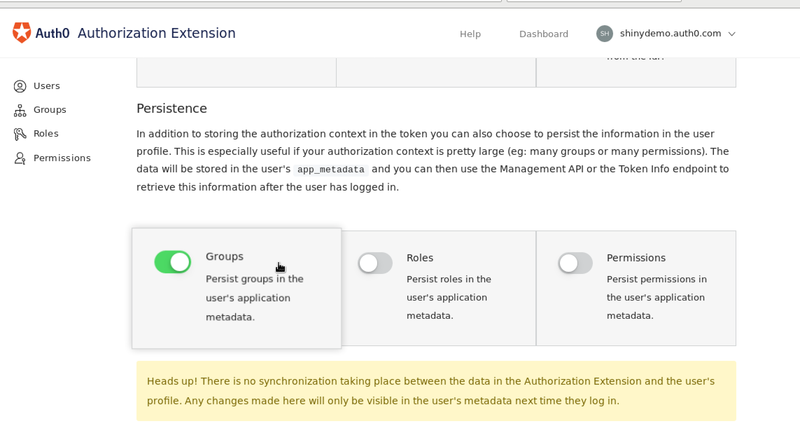 If you've followed all the steps, you'll now be able to control Authorization in your Shiny server!